Falls Church, Virginia - An auction of fine-quality modern prints, posters and works on paper ranging from the late 19th century to present day is planned for Thursday, January 24, by the Waverly Rare Books division of Quinn’s Auction Galleries. More than 250 lots carry estimates of $200 or less, making them accessible to new collectors as well as those who are more seasoned in their buying. In addition to live bidding at the company’s northern Virginia gallery, Waverly is pleased to accept bids through all remote methods, including by phone, absentee or live via the Internet through LiveAuctioneers. An impressive lineup of artists is represented in the sale, including David Hockney, Alfredo Castaneda, Tsuguharu Foujita, James Montgomery Flagg, Pablo Picasso, Joan Miro, Sol LeWitt, Marc Chagall, Marino Marini, Raphael Soyer, Jacques Villon, Clay Huffman, Salvador Dali, Charles Bragg and many others. A serigraph in colors of the first silkscreen print by Mexican artist Alfredo Castañeda (1938-2011), titled Demostracion (Demonstration), carries an estimate of $2,000-$3,000. It is #46 out of an edition of 50 and is signed and dated 1974 in pencil. Presented in a 24- by 32-inch frame, the work comes with a certificate of authenticity and its original bill of sale. Bearing one of the most recognizable images in all of American art, James Montgomery Flagg’s (1870-1960) iconic 1917 World War I offset lithograph poster titled I Want You, measures 40¾ inches by 31 inches in the frame (the sheet is 30 inches by 40 inches). Produced by Leslie Judge (New York), this poster of Uncle Sam encouraging enlistments to wartime military service should realize $5,000-$7,000 at auction. An etching by Pablo Picasso (Spanish, 1881-1973) from the artist's edition of 310 titled Vollard Suite #53: Les Repos du Sculpteur devant le Petit Torse (1933) is signed in pencil and rendered on Montval laid paper with the Vollard watermark. Framed, it measures 15½ inches by 10¾ inches. The pre-sale estimate is set at $6,000-$9,000. A single limited-edition porcelain plate by Sol LeWitt (American, 1928-2007), untitled and made especially for the Bonnefanten Museum in Maastricht, the Netherlands, will cross the auction block with an $800-$1,200 estimate. Measuring 11½ inches in diameter, the vibrantly hued plate is #439 from an edition of 500. It is artist-signed in glaze on verso. Sol LeWitt was a talented multimedia artist linked to various movements, including conceptual art and minimalism. He rose to fame in the 1960s, with hundreds of museums and galleries hosting solo exhibitions of his work since 1965. 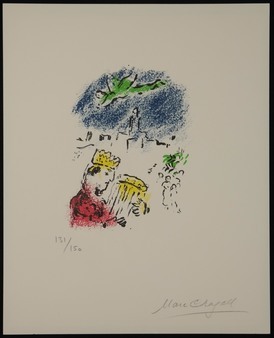 A lithograph in colors on Arches paper by the renowned French-Russian artist Marc Chagall (1887-1985), titled David (1973), is estimated to garner $2,000-$4,000. It is signed in pencil at lower right and editioned (131/150) at lower left. Produced by Editions des Musees Nationaux in Paris, the lithograph’s sheet size is 12 inches by 9¾ inches; the frame measures 27¾ inches by 25 inches. British artist David Hockney (b. 1937-) is one of the most highly valued of all living artists. His original creations sell well into the millions. A color offset lithograph of Hockney’s The Prisoner (For Amnesty International) from 1977, signed in pencil at lower right and editioned at lower left, should easily achieve $1,000-$2,000. The litho is edition #75 of 100 and comes in a 29¼-inch by 24-inch frame. A rare artist’s proof lithograph in colors by Tsuguharu Foujita (French-Japanese, 1886-1968), titled La Reve (The Dream) from 1947, is expected to bring $4,000-$6,000. Signed in pencil at lower right and uniquely editioned “I.I” at lower left, the artwork measures 27¼ inches by 34¾ inches in the frame. It is signed H.C. (hors de commerce), indicating it was the artist's personal choice as best of the series and therefore was not to be made available for sale. Typically, artworks signed "H.C." are selected for use as the display example at exhibitions and/or to be presented as a gift to the publisher or retained for the artist's personal collection. Waverly Rare Books is located at 360 South Washington St., Falls Church, VA 22046. The January 24 auction will commence at 6 p.m. Eastern time. Preview daily from 10 a.m. to 6 p.m., now through auction day. Refreshments will be served at the preview party to be held from 10 a.m. to 1 p.m. on Saturday, January 19. For additional information about any item in the sale, call 703-532-5632, extension 575; or e-mail waverly@quinnsauction.com. View the online catalog and register to bid absentee or live online, at LiveAuctioneers.com. Quinn’s and Waverly are always accepting consignments for future auctions. Visit Quinn’s and Waverly online at http://www.quinnsauction.com.